On 17th May 2011, two new Saint Cloth series; "Saint Cloth Crown" and "Saint Cloth Myth EX", were finally announced to the world. 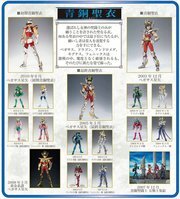 BANDAI has produced action figure series of the Saints from the "Saint Seiya" Anime since 1986, beginning with the "Saint Cloth Series", which was released when the TV series of Saint Seiya was on air. Since 2003, BANDAI started selling the "Saint Cloth Myth" series which is an advanced version of the former type of action figure created by using the latest technology at that time. "Saint Cloth Myth" continues to be popular all over the world. In this column, we are going to tell you about the awsome features of the two, recently announced series by analizing the evolutionary history of Saint Cloth series. Saint Cloth Series "Pegasus Cloth"
The “Saint Cloth Series” is the very first of the “Cloth” toys.The brand debuted along with the broadcast of the television anime “Saint Seiya” (1986-1989), and featured 12cm posable figures with armor that could be removed and fashioned into a display. The Bronze Cloths were the first release in the series, coinciding with the debut of the show. Proving a big hit, they were followed by Black Cloths, Steel Cloths, Gold Cloths, New Bronze Cloths, God Cloths, and Scale Cloths. The Gold Cloths in particular proved so popular that production was unable to meet demand, requiring on one occasion the hiring of an entire factory of workers skilled in chroming Buddhist altar items to keep up. In all, more than five million Saint Cloth toys were sold. In commemoration, special gold version of the Bronze Cloths went on sale, with Gold Saints (such as False Sagittarius) and Ares being given away in a prize campaign. The huge popularity of the toys led to other series incorporating posable figures with removable armor. Some of these were even licensed for sale by other toy companies, showing the tremendous impact the Saint Cloth Series had on the toy industry. A variety of toys besides the Saint Cloth Series were sold during the broadcast run of the Saint Seiya anime. 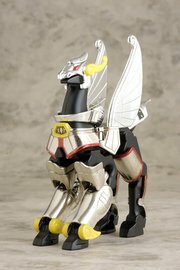 The 18cm tall “Heavy Metal Saint Cloth” toys were large-scale figures without removable armor but featuring enhanced posability. In addition, plastic model kits and vending-machine capsule toys with separate armor were developed, leading in 1992 to the “squashed look” Saint Paradise series. The brand remained vital even after the anime ceased airing on television. In 2000, a decade after the end of the original comic book series, the “Saint Cloth Series Gather Twelve” set was released. This was followed by foreign re-releases of the Saint Cloth Series and even grew to include some all-new figures never released before, such as the Silver Cloths and Hades Cloths. A limited edition series of New Bronze Cloths was sold as a premium with the 2002 Japan domestic release of the Saint Seiya DVD box set. 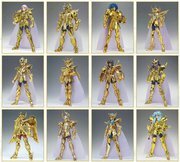 The massive response to the “Saint Cloth Series Gather Twelve”set encouraged Bandai to launch a new Seiya brand: the Saint Cloth Myth series. 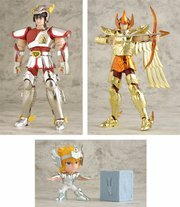 The Saint Cloth Myth figures represent a refined, enhanced version of the best-selling Saint Cloth Series toys. It takes the original concept of figures with diecast metal armor to the next level, harnessing new technologies that didn’t exist when the Saint Cloth Series first hit the shelves. 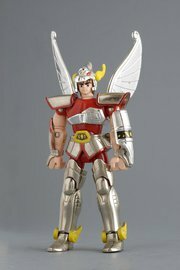 The first figure in the Saint Cloth Myth series, Pegasus Seiya, went on sale in November of 2003. A new Saint Seiya animated series debuted the same year, re-igniting a new boom in Seiya shows and toys. The popularity of the Saint Cloth Myth series Bronze Cloths led to the release of a variety of new characters from the series, such as the Gold Saints, the direct-to-video Hades Saga, and the Final Bronze Cloths. The series expanded to include Evil Bronze Saints, God Warriors, Marine Warriors, God Cloths, Silver Saints, Early Bronze Cloths, and Black Saints. A mail-order campaign in honor of the original Saint Cloth Series was held as well. In parallel with these re-designed figures, a new series called APPENDIX debuted. As of 2011, the Saint Seiya series has grown into an established brand with more than 100 products in the line-up. The accumulated know-how of eight years of production has given rise to new categories such as the Saint Cloth Myth EX and the Saint Cloth Crown series. The tenth anniversary of the Saint Cloth Myth series ushers in a new era of Saints and their battles!